Yesterday, the Carrol County Times Editorial gave a thumbs up to Reef Balls and highlighted an article from earlier in the week. We at Reef Innovations and the Reef Ball Foundation are also excited about the great programs and support from the area. Thumbs up: Masonry students at the Carroll County Career and Tech Center worked with Chesapeake Bay Foundation employees earlier this week to create concrete “reef balls,” which serve as artificial oyster habitats designed to not only restore the bay’s wild oyster population but also naturally clean up excess nutrients in the bay. The Tech Center students planned to create 200 of the reef balls, which can each produce up to 2,000 oysters. Each oyster can filter 50 gallons of water a day. Westminster High School junior Josh Kosmicki, who is president of the school’s Coastal Conservation Association and reached out to the Maryland branch of the CCA to get the reef ball project moving, said he hopes it will help inspire students to be more bay-wise. In Carrol County Maryland students are learning and participating in the efforts to restore our Nation’s estuaries. Projects across the Gulf of Mexico have also been looking to include vocational training as part of their Restore Act project proposals. The Reef Ball Foundation and Reef Innovations have look at education as being an important part of all projects over the past 24 years. Community participation leads to ownership of the project and greater success over time. Masonry students at the Carroll County Career and Technology Center in Westminster team up with the Maryland Coastal Conservation Association and the Chesapeake Bay Foundation to make artificial reef balls out of concrete that will provide habitat to aquatic life in the Chesapeake Bay. Carefully smoothing out concrete inside a bell-shaped structure with a rubber mallet, Francis Scott Key High School senior and masonry student Sarah Kramer worked with Chesapeake Bay Foundation employees Wednesday afternoon to create reef balls at the Carroll County Career and Technology Center in Westminster. The reef balls are part of the Coastal Conservation Association of Maryland’s Living Reef Action Campaign. Coastal Conservation Association of Maryland President Rick Elyer said the group partnered with Carroll County Public Schools about a month ago at the request of Westminster High School’s CCA club. Elyer said the group aims to restore nearly 3 million wild oysters to the Chesapeake Bay by creating an artificial reef. Career and Tech students will cast 200 2-by-2-foot reef balls that CCA will place in the mid-Chesapeake Bay this summer. According to Elyer, an oyster can filter 50 gallons of water a day. 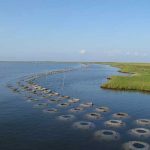 One reef ball will produce 2,000 oysters, creating a natural mechanism to remove the bay’s excess nutrients. Career and Tech students will cast 200 2-by-2-foot oyster reef balls that CCA will place in the mid-Chesapeake Bay, creating natural mechanisms to remove the bay’s excess nutrients. Westminster High School junior Josh Kosmicki, who is president of the school’s Coastal Conservation Association, said he hopes this project will help inspire students to be more bay-wise. While some students mixed cement donated by Lehigh Cement Co. in Union Bridge, CBF’s Oyster Restoration Coordinator Dan Johannes worked with Kramer and other students to affix a bell-like frame to plywood. CBF’s Patrick Beall sprayed the inside of the frame with sugar water and added sand to the mold to seal the bottom. To create entrance and exit holes for the artificial habitat, the group inserted tetherballs and a large bladder ball into the mold. Then students shoveled and smoothed the cement in the structure, which was created with additives and aggregates from concrete supplier Thomas Bennett & Hunter Inc. in Westminster. After the structures dry overnight, students will deflate the balls and remove the reefs from the molds. Carroll County Public Schools Science, Technology, Engineering and Math Coordinator Bryan Shumaker said the reef ball project was great because of the multidisciplinary approach. “The science and mathematics of mixing concrete is something we teach every day, but this project helps our students see how what they create can make an amazing habitat for dozens of different bay organisms,” Shumaker said. Tech Center masonry instructor Mike Campanile said he and students are proud to be part of an environmental project. North Carroll High School junior and masonry student Austin Lowe, who helped mix the concrete, said the project was something unique for the class. “It was definitely different and something I’ve never done before. I think it was a good learning experience,” Lowe said. The DRC has been working with Dundalk Middle School’s Green Club in a variety of activities that not only help with community improvements but also encourage environmental stewardship with local youth. Dundalk Middle School Green Club’s latest project has been creating reef balls that will go in our waterways. A reef ball is a designed artificial reef that is constructed to mimic natural reef systems using a special, marine friendly, concrete. They are used around the world to create habitats for fish and other marine and freshwater species. With the help of Joe Davis, Baltimore County Public Schools Office of Outdoor Sciences, the Green Club has been able to create multiple reef balls that will be placed in our waterways.